Lovely, Miriam! You look perfectly elegant. So beautiful! I really must get around to making myself a tired skirt! My problem is that I get a nice skirt but then it only matches on shirt in my whole wardrobe! 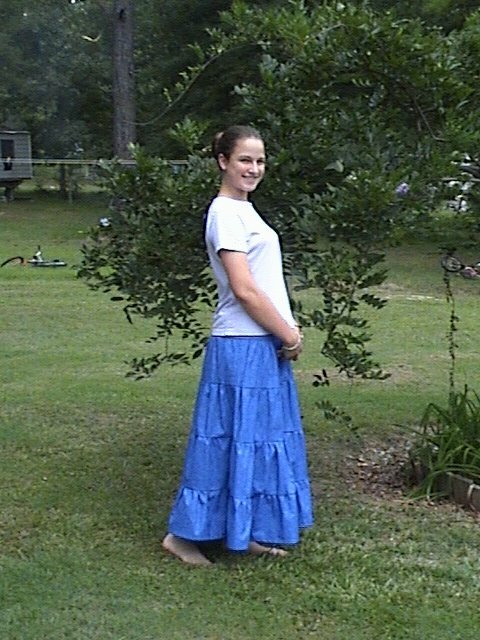 That's why I like denim skirts so much! Do you think the pattern you used with your skirt would work with denim? It would probably work with denim. It might a little bit more difficult with gathering, but that's all. Beautiful, and I will say it again. I wish I was that talented! Pretty, pretty. I love tiered skirts! Nice skirt. It is lovely, and I love what you asked your Dad! Very Funny! Very lovely! I have a pattern for one, but I just haven't had a chance to pick out material. I hope you are both doing well. It's been ages since I have heard from you. I am sure you are super busy with school! Beautiful skirt! What pattern did you use? I used New Look #6565. You should be able to buy it at Wal-Mart, and it's real cheap.